Patri has several meanings, in Hindi it means pavement, in Urdu it means track, and in ancient Sanskrit it means a vessel or small furnace. The name took us back to our origins and we decided to use pavement, tracks, and furnace to come up with a street food menu which contains all three elements. 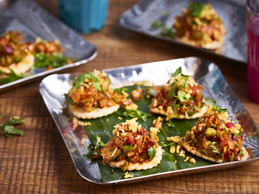 Our starters are street food classics on pavements in India and Pakistan. Our grills are freshly cooked in the tandoor at over 400 degrees to replicate cooking in a furnace. 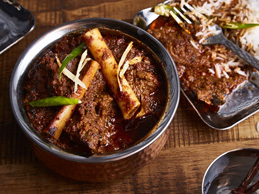 Our curries are inspired by the railway cooks on train journeys in India. Our version of Jodhpur’s lovers speciality chat of insanely hot dry spice mix on a wheat ball topped with extra hot namkeen mix, chopped tomatoes and green chillies. This chaat has gained legendary status and some rate it as the world’s spiciest chaat for men to consume in order to manifest their love. Spicy, tangy, juicy and mouth-watering white peas topped with raw chopped tomatoes, onions, green chillies, coriander leaves and lemon juice. Paired amazingly with soft buttered kulcha flat bread. 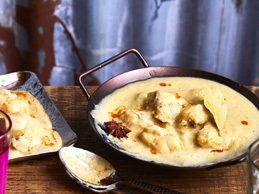 Tender monk fish cubes slowly cooked with whole spices, almond-cashew paste and a generous helping of cream, milk and curd. With a luscious texture and royal white colour, it is truly a celebratory grand curry. 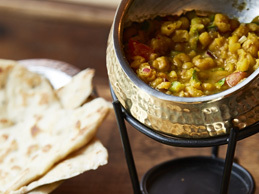 The best dishes, such as the palak paneer and the black dhal, were genuinely good, and the attractive presentation of the chaat showed a kitchen that cares about detail.